Colloidal anhydrous silica, magnesium stearate, talc, maize starch, lactose monohydrate (33 mg), sucrose, calcium carbonate, titanium dioxide (E171), copovidone, macrogol 6000 and povidone carmellose sodium. I suffered from adult acne in my early 20s, taking the yasmin contraceptive pill and using zineryt eventually cleared it up. 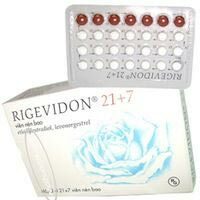 I was clear for four years and was on different pills in this time (cilest, microlite and gedarel), then I was given rigevidon. I was on this pill for over two years and it brought all the acne back. It was slow at first, the odd spot here and there but over time it got worse so that I was constantly broken out. Because it didn't happen suddenly and a pill has never broken me out like that before, it took me ages to connect my problem skin to the pill. Eventually, I did. I'm now in my third month back on gedarel and my skin is already looking much better. Avoid rigevidon! Was prescribed this pill for my PCOS and found my skin went from pretty much clear to horrible sore, red breakouts all over my face! I tried using BP/ salicylic acid/ regimens/ treatments and nothing would stop the breakouts. Would not recommend for acne at all! Birth control Break outs Mood swings Used this pill for three months and it did not help my acne at all. My skin was actually better before i went on this, however i had come of dianette shortly before so could be that my acne had not had time to come back before changing pill. Also would get upset very easily.